Do you like the colour white? Do you like the absence of other colours? Then white night is the night for you! 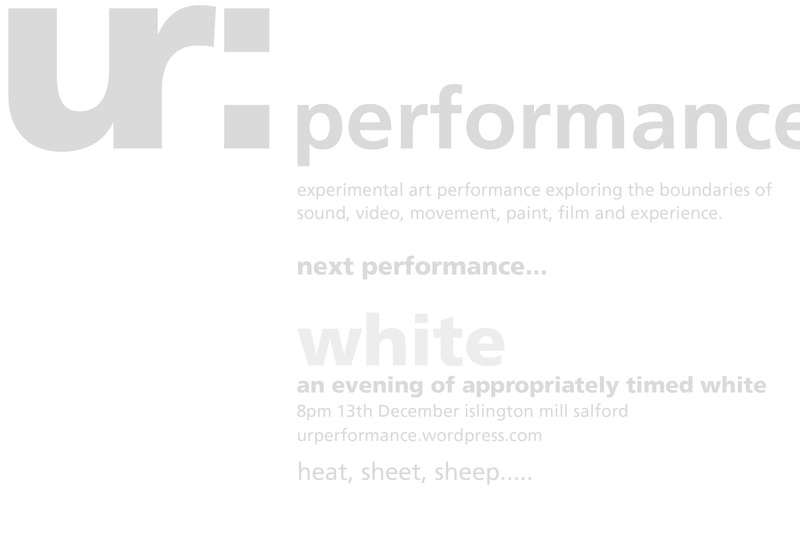 ur:performance are offering you a chance to experience the all encompassing white ness of white, with a white night of all shades. Unsure if you like white? Then come along and see the white that we have on offer, we have white for everyone! We have white for all ages, seasons and those with dietary requirements. First amongst those guests is a returning guest artist; Estelle Woolley. Estelle recently won the public vote for ‘The People’s Prize’ in the annual open exhibition ‘Life, The Universe and Everything’ at The Aardvark Gallery, Chester. You can find out more about Estelle and her work here at Axis or through her website. Plus you can follow her on Twitter – https://twitter.com/estellewoolley. The second guest artist to confirm is Mike Chevez-Dawson. He will undertake ‘Reworked Part 3’; this refers to the performance he did at The Contemporary Six gallery, for the ‘Paraphrase’ exhibition. The performance took place on Thursday 31st May from 2.30pm until 5.30pm. Where images were overlaid, repeated, mirrored into a visual mantra which came to resemble images you may find within a psycho-analytical examination. Further ‘guest artists’ will be released as we get closer to the event night. To see a little of what ‘White’ was about.